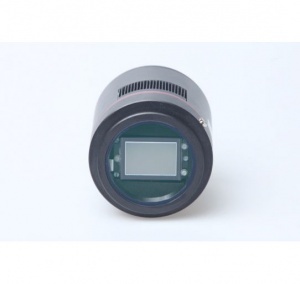 The QHY11 is a full frame (35mm Format), 36 x 24mm, cooled CCD camera in a compact body. It uses the well-known On Semiconductor (Kodak) TrueSense KAI-11002 Grade2 CCD, offering a big field of view. The 11 Megapixel CCD has 9um pixels for excellent resolution and a wide field of view in many telescopes. Numerous APODs have been taken with cameras using this CCD. The 9.0um square pixels with microlenses provide high sensitivity and the large full well capacity results in high dynamic range. The vertical overflow drain structure provides anti-blooming protection and enables electronic shuttering for precise exposure control. Other features include low dark current, negligible lag and low smear. The QHY11 cooling typically achieves a -45C delta T from ambient. This temperature exceeds most of other cameras based on the KAI-11000 or KAI-11002. Lower temperature results in lower thermal noise and fewer hot pixels with this camera. The QHY11's small round case design allows it to be installed in the Hyperstar System or at the primary focal plane. With the appearance of more and more new big image circle Schmidt camera like the RASA telescope or the C11F2 system, the QHY11 is an excellent choice for these new wide field telescopes. Since 2015, QHYCCD has supplied a heater for the optical window on the QHY11. This heater prevents the optical window from frosting. For conditions with high humidity, the QHY11 CCD chamber has a connector for the desiccant plug to dry the CCD chamber. The QHY11 also comes with a cable clip which helps secure the contract of the USB and power cables. The QHY11 is available in both mono and color. For the color version we only accept pre-orders.